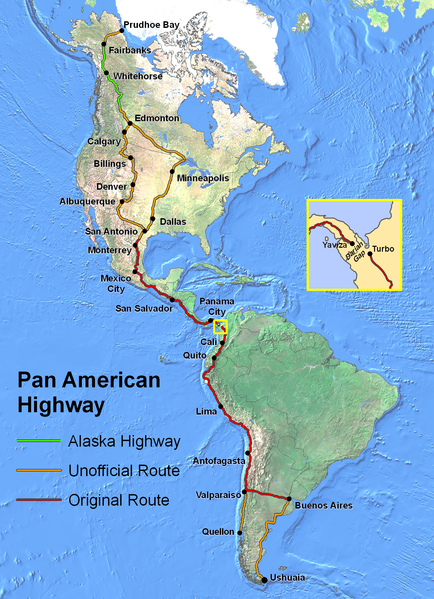 The Panamericana is a Road Network who cross two continents and 12 countrys. Just a small part between isnt connected, the darian gap. It is one of these famous routes like the Silkroad or a Transafrica over east or west who let travellers dream about, to drive there sometimes in their live. Each year severall travellers start a trip on one of these parts of the world The Swiss television did in its format DOK a documentation about the "Panamericana" in 7 pieces at the year 2011, which is still available online. Absolutely worth seeing, is very well suited as an appetizer in the preparation of such a journey. Many helpful blogs of travellers are linked there in details. Blogs who are helpful for Paperwork, Visa, Border crossings. Blogs who had collected GPS Waypoints of Wildcamp-Spots ore places who the travellers meet each other, so called "overlander hotspots". Blogs who had written in details about shipping costs and handling. In short, a very comprehensive compendium of such a journey. From crossing the darian gap till many border crossings, very helpful informations. There are also special themes linked deeply. Like travelling with dogs, travelling with kids, garages and mechanics in south america. This website is a little time machine for us overlanders, save us hours of searching at the internet. Such projects live from us travellers. If you start your journey, I hope you remember about where you get so much informations, and you can help us others with updated informations. Also the africa overland Network has a category "Panamerica / the Americas" http://www.africa-overland.net/The-Americas who is worth to visit, because some travelers are listened just on this website.